With a fanfare of horns, ministers announced a crackdown on selfish motorway drivers who hog the middle lane and don’t move over for faster cars. They’ll be fined £100 and have three penality points slapped on their licence under new rules being drawn up by Transport Minister Stephen Hammond. A great eye-catching idea to get Britain moving, you may think. But forgive me for wondering if, like so many well-received initiatives, this will never happen. Labour came up with the same popular idea years ago – and it died a death on the hard shoulder of policy-making. Back in June 2005, then roads minister David Jamieson announced he was determined to halt the selfish practice which causes congestion, accidents and road rage. He also asked the Highways Agency to explore the possibility of using the variable message signs on motorways to encourage middle lane hogs to move over. Police already have power to stop motorists for poor lane discipline and have the power to prosecute if they consider a driver’s behaviour amounts to inconsiderate driving. 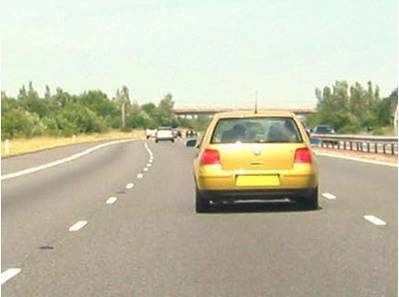 The habit of hogging the middle lane on motorways, regardless of conditions, was labelled as one of the top ten menaces on the road in an RAC report. So, full marks to Mr Hammond for taking up this issue. But get your foot down, sir, and please don’t pull off at the next exit. And forgive me if I don’t hold my breath.